With video being well-established as a choice business communications tool, enterprises large and small require end-to-end streaming solutions that address everything from grandiose productions with a global reach, to more modest, workaday presentations. Streaming tech developers have responded by offering scalable systems designed, as they claim, to meet most streaming needs. While a lot of talk focuses on 4K these days, AMX SVSI recognizes that not all organizations are ready to adopt the format, while others are making the shift. 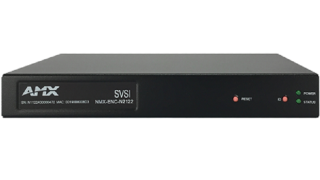 Its N2000 Series features three systems for encoding and distributing sources onto an existing IP network: the AMX SVSI N2000 Digital Cinema Grade (supports “most common” HD resolutions up to 1920x1200); the AMX SVSI N2000 1080p Low Latency solution (which also supports common HD resolutions up to 1920x1200); and the AMX SVSI N2000 4K UHD. Each system features JPEG2000 compression, and the manufacturer has designed the series for use in applications ranging from enterprise communications and education, to markets such as entertainment, stadiums, and houses of worship. Capable of AV capture and distribution for both live streaming and recorded media, Extron’s SMP 351 will record and stream simultaneously at two different resolutions and bit rates. The SMP 351 supports HDMI, component, composite, and optional 3G-SDI signals, and can apply two-window processing to the selected sources. On the higher end, the SMP 352 will create independent recording from two different sources. Both models are based on the manufacturer’s FlexOS system operation platform, and neither come with licensing fees. Also in Extron’s family of streaming products are the SMD 101 H.264 decoder, designed for use with Extron encoders for end-to-end AV streaming; as well as the SMD 202, a compact media player and live stream decoder for H.264 streaming. With Microsoft announcing the phasing out of systems such as Windows Media Server and Silverlight, as well as Java raising concerns among the IT security community, Haivision argues that organizations haven’t had options when it comes to standards-based streaming technology that is capable of playing nice on an existing IP infrastructure. As a result, the company behind the Calypso Enterprise Video Platform recently released a secure, standards-based multicast option for its system. The new release supports SSO (single sign-on) to provide security for internal, confidential video communications. Kaltura’s Video Platform as a Service (VPaaS) is just what its name suggests: a cloud-based video platform for the creation, deployment, and management of video. The company says that on this platform, users may integrate video as a native data type into existing platforms and workflows through the application of Kaltura APIs, SDKs, and developer tools. Available in public, private, or hybrid cloud environments, Kaltura’s VPaaS is touted to support all devices, workflows, and applications. It enables users to manage and white-label a multitude of unrelated accounts on a single platform, and is runs independent of the organization’s existing operating system or infrastructure. With a focus on real-time encoding, streaming, transcoding, and recording, Matrox’s Maevex 6100 Series of encoders and decoders comes in a variety of shapes and sizes, including PCI Express cards, standalone appliances, and OEM versions of the hardware and software (with APIs and SDKs). The series provides Full HD, 4K, and 8K extension and switching over standard IP, and for enterprise video management systems, Matrox Advanced Hybrid Streaming (AHS) is included. The manufacturer says that the series offers “maximum interoperability” with third-party hardware and software for live streaming and recording, and supports the most common streaming protocols, such as RTMP, RTP, HTTP, MPEG2.TS, and RTSP. The Maevex 6100 Series is compatible with Matrox’s Maevex 5150 Series, as well as third-party hardware and software. Sonic Foundry has extended its Mediasite Video Platform to include Mediasite Join, a UCC solution that will work with conferencing systems by developers such as Cisco, Lifesize, Polycom, Sony, Tandberg, and Zoom. Streaming UCC is achieved by inviting Join as a participant on video calls, enabling those present to automatically record and distribute multipoint H.323 video synchronized with H.239 content. There is a cloud-based version of Mediasite Join, or an on-prem solution for those who prefer to keep things in-house. Both versions will publish recorded video calls to Mediasite Video Cloud or Mediasite Video Platform. Home of the CORIOmaster and CORIOmaster mini video processing systems, tvONE recently came out with new 4K input and output modules, as well as a 4K streaming media input module. (For those who love long model numbers, here they are in respective order: CM-HDMI-4K-2IN; CM-HDMI-4K-SC-1OUT; CM-AVIP-IN-1USB-1ETH.) Both CORIOmaster and CORIOmaster mini are capable of managing up to four canvases for the support of multiple video walls, and will do 360 video rotations, multi-image processing, and rotation and edge blending. The release of these new modules is in conjunction with the introduction of tvONE’s CORIOgrapher v2 control software, which also addresses 4K with the addition of UHQ (Ultra High Quality) windows for 4K sources. Vaddio’s AV Bridge MATRIX PRO was designed to do just that––bridge the gap between AV gear and PC software. Capable of supporting multiple cameras, microphones, and displays, the system can be connected to the cloud for distribution of content. The system is comprised of an AV encoder, a four-input seamless HD video switcher, three built-in interfaces for Vaddio cameras, an audio matrix mixer/switcher, and four audio ports for Vaddio EasyUSB microphones. An embedded web server with a user interface acts as the control panel, and USB and IP streaming can be done simultaneously. Wowza and NewTek have teamed up to present the Wowza/NewTek Media Distribution System (MDS1), an all-in-one video streaming appliance for the enterprise. With four inputs and four outputs, the developers claim that all users need to do before going live is plug in the cameras and configure the stream. The system will integrate and scale streams with Wowza Streaming Cloud and Wowza CDN, includes built-in NewTek AV production tools, and features integrated NDI technology that supports inputs and outputs over IP. Wowza also recently released the Wowza player, an embeddable media player for integration with existing Wowza workflows.